Angus Fisher’s Birds of New Holland folio exists as a contemporary accompaniment to J.W. Lewin’s 1808 folio of the same name. 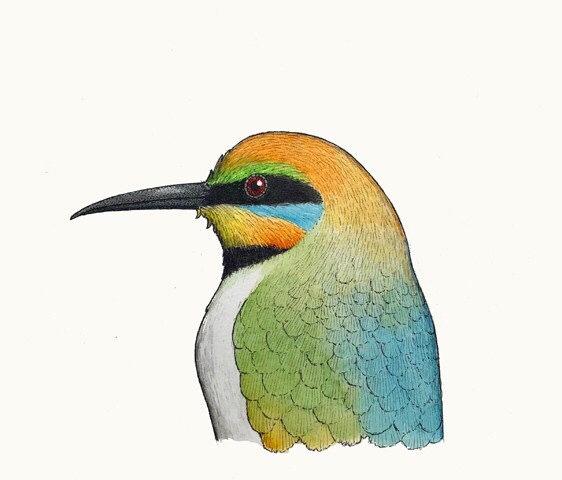 Fisher’s folio consists of 24 editioned hand-coloured etchings that document the birds of the contemporary Greater Sydney region, similar to that defined as ‘New Holland’ in Lewin’s original 1808 publication. and scenarios common to their habits. The folio, which features many urbanised settings, not only demonstrates this dramatic human development of the area in the 200 years, but also, the integration between nature and the built, human world. The folio aims to develop Lewin’s vision of the ‘Sydney’ area by providing a more mature, contemporary and holistic interpretation of ecology and the ‘natural’ world. No longer are birds simply ornaments of a wild and alien land, the natural domain and the domain of the human have become both literally and philosophically entangled. Terra Australis showcases for the first time Fisher’s stunning Birds of New Holland folio in its complete, collated form, as well as a magnificent installation of the individual prints. Fisher’s intricately detailed and vibrant drawings are testament to the breadth of the artist’s deft technical skill across a variety of media and techniques. Terra Australis is current until 6 May 2018.